A proper fit is one of the most important yet commonly overlooked parts of cycling. An improper fit can result in a large array of issues, including but not limited to, neck, shoulder, back, and knee pain. As well as lack of power, saddle issues, and upper body fatigue. Most bikes can be adjusted to fit the rider better by replacing a few key parts such as the saddle, stem and handlebars. Aside from adjusting your current bike to fit you better we can also fit you to a bicycle you are planning to purchase in the future by determining the proper size and geometry. The fitting process usually takes an hour to an hour and a half. 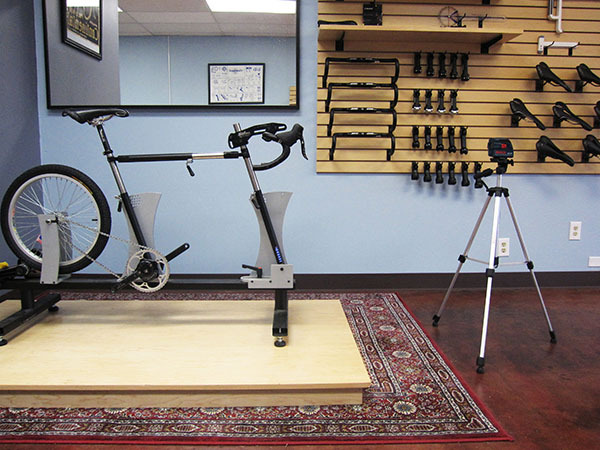 The fitting session costs $50 per 30 minutes (free if you purchase a bike from us). Because our shop can only perform one fit at time we ask that you make an appointment. Feel free to email, call, or stop by to schedule a fit.